Casino Dingo online casino is one of the hottest online casinos among Australian players today. Nothing screams more Oz than dingoes, right? If you're looking for a way to get your bankroll stretch as far as possible, how about giving CasinoDingo.com the chance to reward you with some money back to play with? 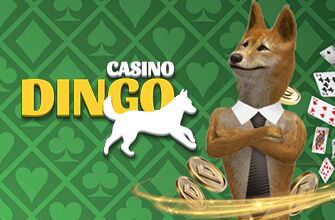 Simply play and deposit each week, and Casino Dingo will allow you to get cash back on your deposit every Monday. "This is an amazing offer that should have you absolutely howling with excitement, be sure not to miss it!" says Casino Dingo. You can choose 25% cash back with a wagering limit (wager 50 x before you can cash out). According to the online casino "you get to see real returns on your money, all whilst enjoying your favorite games." If you deposit $100 and you choose the 10% option, you will get $10 back. If you choose the $25 option, you'll get $25 back, as long as you adhere to the wagering requirements. Contact customer support today and quote the codes CB10 and CB25. If you still haven't opened an account with the licensed Casino Dingo, now's the time to take full advantage of the site's welcome package. You have the opportunity to win up to $1,400 bonuses on your first four deposits. Wager requirements apply to this offer and others at the online casinos.